Lori was adopted by Traci and her rescue Theo (not pictured) of Anderson, along with her two cats. Traci has been rescuing and helping foster dogs for years, but has always admired the greyhounds. 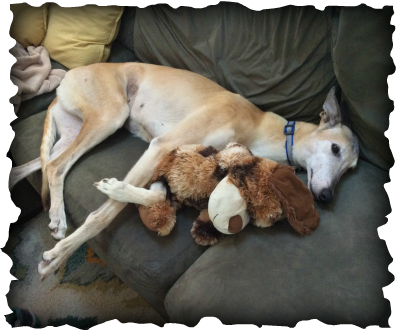 When she decided it was time to add to her family, the greyhound fit the personality of what she wanted perfectly! As soon as Lori arrived at the home she went right up to Traci and just leaned on her- this was all the sign that Traci needed to know this was going to be Lori’s forever home. Luckily, Lori met both cats, showed no interest, i was fine with Theo being a little hesitant of her and gave him space. We will definitely be seeing this gorgeous brood out at our events!